Former Munster, Ireland and British Lions rugby captain. Paul O’Connell is Ireland’s third most-capped player and the joint-thirteenth most-capped international player in rugby union history. O’Connell has captained Munster, Ireland and the British and Irish Lions. Paul is a family man, he is married to his wonderful wife Emily since 2013 and they have two children together Paddy and Lola. As described by himself, Paul O’Connell’s training schedule sounds demanding by any sportsperson’s standards: six to eight every midweek morning, six to seven every midweek evening, nine to eleven Saturday mornings and eight to ten Sunday mornings. And not a rugby ball in sight – this was Paul’s swimming regime as a primary schoolboy in the 1980s! By the time he started secondary school in Ardscoil Rís, Limerick, Paul O’Connell was a champion under-age swimmer. After rising through the amateur ranks with Young Munster in the All Ireland League, Paul O’Connell made his debut for Munster against Edinburgh in 2001 and for Ireland against Wales in the 2002 Six Nations championship. Paul played for Munster 178 times in total. He succeeded Anthony Foley as captain of Munster in July 2007 and went on to become the club’s most successful captain of the professional era. During Paul’s time with the club, Munster won the Celtic League/Pro12 in 2003, 2009 and 2011, the Celtic Cup in 2005 and the European Heineken Cup in 2006 and 2008. The highlights of Paul O’Connell’s international rugby career are staggering. 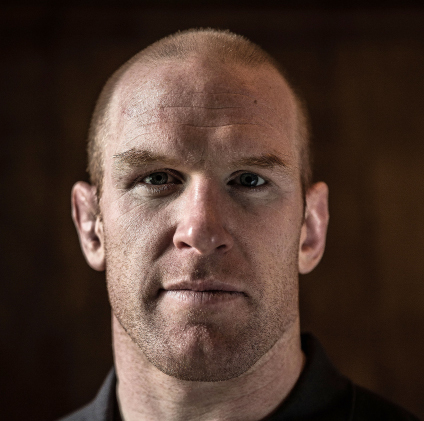 Since debuting for Ireland in 2002 until his final match in the 2015 World Cup, he played for his country 108 times, captained the side 28 times and scored eight tries. He was part of the Ireland team that won the Triple Crown in 2006, 2007 and 2009, the Six Nations Grand Slam in 2009 and he captained Ireland to back to back Six Nations Championships in 2014 and 2015. Fittingly, O’Connell was named 2015 RBS Player of the Championship and Guinness Rugby Writers Player of the Year. He represented Ireland at four Rugby World Cups, in 2003, 2007, 2011 and 2015. Paul was part of three British and Irish Lions tours and he played for the Lions seven times in total. His first tour was to New Zealand in 2005, he was captain of the 2009 side which toured South Africa and he ended his Lions career as part of the victorious 2013 side who were 2-1 winners over Australia. In addition to his stellar rugby career, Paul has carried out many philanthropic work with the UL Foundation, Paul is also involved in a number of national and local charities and volunteer initiatives, including Special Olympics, Haven and Team Limerick Clean-up. Epitomising all that is good about Limerick, he was awarded the Freedom of the City in April 2012 and was an ambassador for Limerick City of Culture 2014. Paul is a warrior on the pitch, a gentleman off it and above all a true leader to all those around him.